Some of you may have read my PTR feedback thread about Kerrigan earlier last week which you can find below, so I won't talk about her new talents/mechanics and stuff like that but this is sort of a follow up since shes now on live servers. 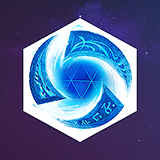 What I really want from everyone in this discussion thread is to give me your thoughts on Kerrigan's overall power and how different she is from her last iteration. 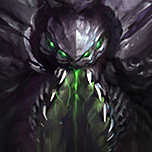 Starting off things from my perspective I feel as though Kerrigan is in the exact same situation as her 1st rework in which she came out slightly overtuned and the proceeded to get a few patches of nerfs resulting in use of a single talent build that we saw for some time. I've been trying out a lot of her different new talents and honestly the only build that seems viable is the W build with Kinetic Fulmination at 4 and Painful Spikes at 16. These two talents alone allow her to have just insane damage output. Outside of W build though it seems Q build is rather lackluster and can't output nowhere near the same amount of damage. Her level 13 tier seems pretty 1-sided as well with Volatile Power almost being mandatory. I've tried Psionic Barrier against mage comps and it just wasn't getting any value almost like that talent wasn't even working or something. 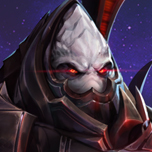 When we all saw the new Kerrigan Iceblock talent with Chrysalis in the teaser video it seemed really cool but it practice is probably the worst talent on this tier. The cooldown is extremely long at 90 seconds and is burst down very very easily. What I find funny is that Kerrigan builds almost the exact same way as she did before with everyone taking Fury of the Swarm at 1 (use to be tier 4) then W power increase (use to be tier 1) and then Bladed Momentum at 7. I guess the point I'm trying to make is that the power these talents give feel mandatory as apposed to be being a choice similar to her last iteration. Her cool downs are just ridiculously long and Bladed Momentum circumvents that. 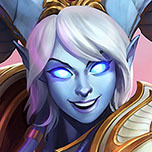 All in all I feel her talent diversity is kind of poo right now, nothing that can't be fixed with a little tuning but what I'm scared of is Blizzard is going to go overboard and overnerf the W build and then not buff any of her other talents as they are all under-performing in my opinion. I just don't want a repeat of what happened last time with her 1st rework and we're left with only one viable build for 2 years. Shorter range on her Q also feels bad. Basically, no one can even touch her. Currently works as tank, killer and supports herself thanks her assimilation and chrysalis talent. Her was already good before, it is true that a little easier to kill than it should, but from there to be a tank as her is now... It's too much. Now let's talk about her Q skill, basically can not be spent if you have the third talent (level 7), not to mention that there is 3 improvements of her ultimate, while the other heroes only have 2 at best. About her mana, practically it can not be wasted, you can spam the Q skill since level 1 without major problems. For when you have spent all mana, you have a heal font ready in your closest keep. Yeah the range decrease on Q does feel really bad. I would give up the extra charge in a heartbeat for the original 8 range. You basically have to be right next to the target to Q them now, it's kinda silly. Her ability to chase down in those 1v1 situations now is basically gone. I've had opposite results. Seems almost impossible to chase down in those 1v1 situations anymore especially against mobiles like Li Ming. Just today I faced off against a ming and her teleport always out ranged my Q; granted she did have the upgrade. you are wrong with just one thing, kerrigan isnt as much overtuned as she was in her last rework, that was complete insane, this one is probably the only rework that didnt make the hero OP, kerrigan is pretty balanced, maybe only 1 or 2 talents could give some dmg burst, but thats nothing big, and she doesnt seems oppressive or other stuff like that, ofc you know how to dodge a combo and how to counter her. New Kerrigan's chase is absolutely incredible. I've repeatedly killed people right next to their towers and even when they were about to pass through their gate (they thought they were safe lol). I've had plenty of instances of getting 2-3 kills and even got my first team wipe earlier. of course, she really only has one major build with some occasional talent variation. However it's much more fun and much more effective than stuff she had previously which is great. I also thought the range reduction was gonna make her not great but she's very oriented around using the two charges of ravage to start and keep combos going. so while initially engaging may not being as good as before, actually securing kills is something she does better than ever. I love it. 1- The patch notes says her playstyle should play mostly like pre-patch but I disagree. Her power budget in teamfights has been shifted from hitting the perfect combo in a teamfight to micro-ing chain Qs. Combo damage has gone down (I don't count the pulse on her E as part of the combo, and you don't always want to hit 2 Qs on the hero now). 2- You have more things to keep track of now. There are a lot of talents that require stacking damage on enemies, e.g., you often have to track now how charged Kinetic Fulmination is and how much longer the buff lasts. Kerrigan before was more about patience and timing; you had to have a feel for when the perfect time was to dive in and go all-in on an enemy. She felt like a true ambush assassin. Now it's more like you have to keep track of a bunch of timers in your head simultaneously (Q reset timer, Kinetic fulmination timer, spell power boost timer, how many Q charges you have, etc. ), and more important, you want to spam attacks more to keep the charges building. 3- I was comparing damage numbers, and I do not think the new Kerrigan averages more damage than the old one. What makes her stronger is her shield regeneration is a lot stronger. Especially the level 13 talent. I think they will nerf her trait (not sure why they buffed it by 50% baseline; that alone would have made her a lot stronger), and then she fall back to a very high skill floor hero. I've had plenty of instances of getting 2-3 kills and even got my first team wipe earlier. The problem is that even low skills kerigan can just jup in get a kill and survive. I even saw kerigans, who didn't know how to manage their kombo, go in get kills & survive. It means their opponent's were even more low skilled. 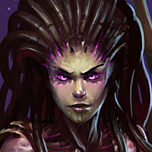 New kerrigan does more damage, has more kill potential and can generate more shields than before but it comes at the cost of a harder start up for combos due to the reduce ravage range and the mana cost of constantly using her abilities. if she isn't landing combos but still getting kills, her opponents are bad. I agree that her most consistent build is the same W build. Kinetic Fulmination coupled with Painful Strikes is a bit too good. Especially if you are jumping in with Maelstrom and pulling in 2+ heroes. The Q build is a little weird. IMO one of the Q build talents should up range. Probably Sharpening Blades once the quest is complete. The Q build is just too short of range if you are trying to leap to things in the back rank. The Q range barely goes further than Stitches body circle. That is just odd. Its like you have this big talents to hop around but you range is so short that hopping around feels superfluous almost. The E build I don't even know what to say. This one has some talents for it but nothing about it seems appealing. A 2nd pulse after 2.5 secs?!? You can barely hang around someone after the initial combo let alone sticking around for another 5 secs. Maybe if they had 2 pulses one at 1.25 secs and another at the regular 2.5 secs might work. Honestly I think this one should be totally reworked to be something else entirely. Now I will say that I have had some great games where things have just worked out or you make the most perfect combo. Some games you say to yourself how did I just 1v3 those guys and then there are other games where everything feels just a bit outside your reach. 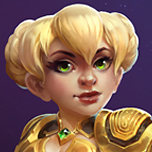 She WILL get some nerfs in the upcoming 1-2 weeks (mostly to her trait or trait related talents) other than that I doubt much will change. Lvl 100+ Kerrigan here, been waiting for a rework. I love being able to stun an ulting Kaelthas out of his Pyro with Ultralisk or use Chrysalis to escape Thrall's Sundering. Getting multiple ravages off feels incredible. The change in mindset about timing to timeouts is 100% correct. Reduced range has been very annoying for chases, but I'm always in deep anyway so it only comes up 2-3 times a match. Ravage -> combo -> Ravage -> Psionic blast is silly fun. 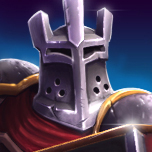 Shield update has definitely been noticeable and appreciated, but I miss double strike. Would have LOVED a combo quest. Been playing a lot of Butcher lately and would have enjoyed a similar mid-game boost like his meat quest. Q build isn't as strong as W for sure (I've never built for Ravage anyway), which can output some serious damage. Still haven't fully played around with Maelstrom yet. If you can't/don't know how to land a combo on people that know how to avoid the combo you shouldn't be maining Kerrigan, but I agree it's now more forgiving for these types of players with the additional Ravage. I have a feeling once people get used to her double/triple Ravage the utility of it might decrease, but right now you can just punish people. W build is mandatory. 5 second stasis in chrysalis does more harm to yourself than good. Ultralisk is cool and is actually way better but omegastrom is also mandatory with volatile power and extra benefit to w talents. Her damage combined with her extra shields make diving in to large numbers of enemy heroes a viability which reminds me of Kerrigan like a year ago. She's at a good carry point right now where she can burst so much damage even if you die with her if you combo 3+ ppl with w talents and all the aoe your team should clean up the fight without you. 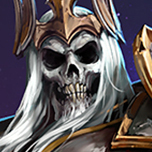 I still don't like this heroic, still feels underwhelming. Dies way to quickly and it's hard for it to catch mobile heroes.